The pilot project covered almost 140 miles, approximately a quarter of the whole route. 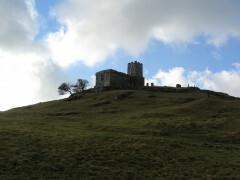 It extended from Brent Tor on the western side of Dartmoor to Glastonbury in the heart of the Somerset Levels. We chose to start with this section primarily because it is close to home which proved convenient when resolving difficulties which arose in establishing a new venture. Learning through trial and error and gaining confidence and credibility that we were able to complete such an ambitious undertaking gave a foundation which we have been building on, extending the route east and west across the country. 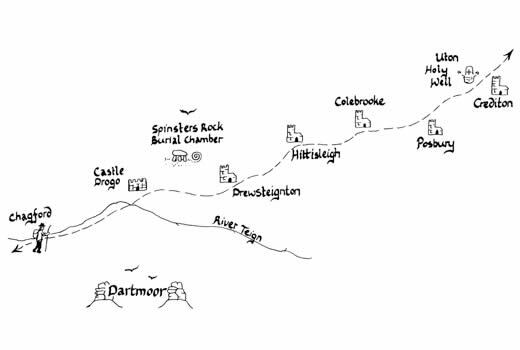 Brent Tor is an iconic and spectacular landscape feature in its own right, with the tiny parish church of St Michael de Rupe perched on its summit. It is one of the crossing points of the Mary and Michael earth energy currents dowsed by Hamish Miller. 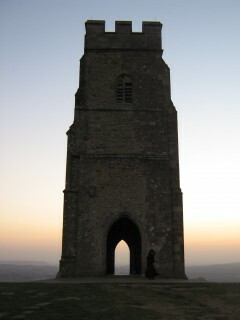 There is a pleasing symmetry with the end point in Glastonbury. 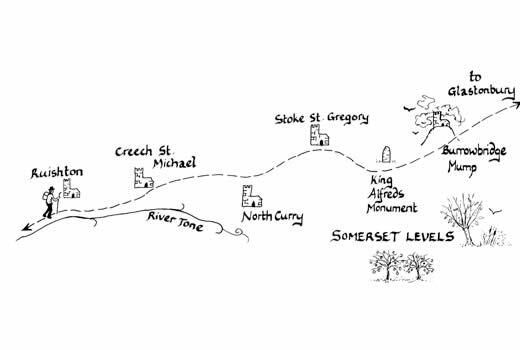 The journey from Tor to Tor, St Michael’s church to St Michael’s tower is a significant undertaking in its own right. 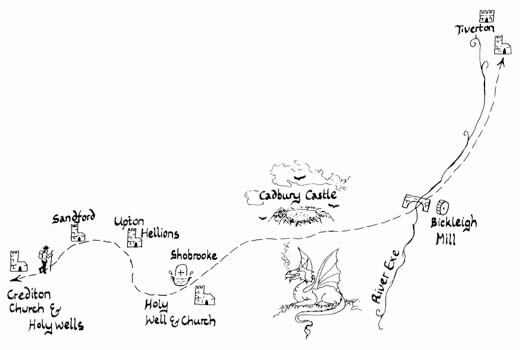 Glastonbury, the mythical Isle of Avalon has been a destination for pilgrims for thousands of years. 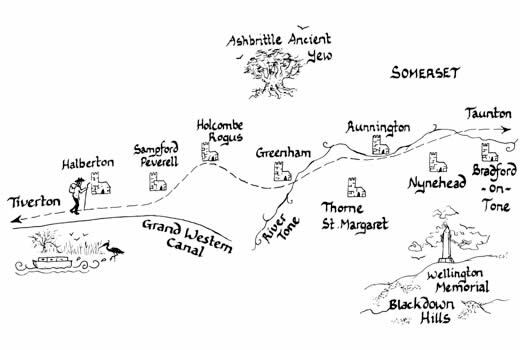 During the Christian era its association with Joseph of Arimathea made it a pre-eminent place of pilgrimage in England. Today it retains an allure which draws spiritual seekers from diverse backgrounds, stirs the imagination and nourishes the spirit. The pilot section is rich and varied in many ways as you can see in our galleries of photographs. 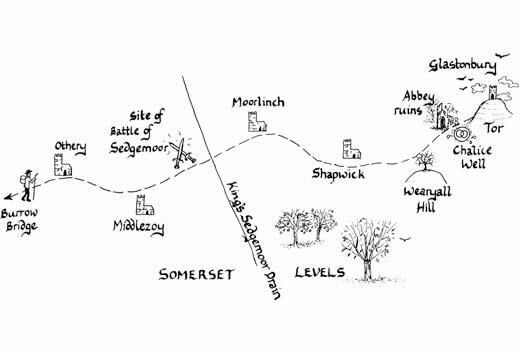 It crosses Dartmoor – some of England’s wildest (and sometimes wettest) terrain; passes through the rolling landscape of Devon’s heartland; along river and canalside paths, until it reaches the unique environment of the Somerset Levels. This journey offers a context to explore over 5000 years of human history and culture. Religious belief, politics and economic rise and fall have all left their mark along the way. There are numerous churches and other monuments to faith as well as places of natural beauty which link us back through time, representing as they do, the evolution of human spiritual belief over millennia. Many locations along the way retain a stillness and peace within or around them which can enhance our own capacity for reflection and insight. In this regard, the journey is a metaphorical as well as a literal one. The outer pilgrimage provides an opportunity for inner transformation. A true pilgrimage is where the traveller is guided by the spirit of the enterprise to visit places which have an effect on the innermost spirit. 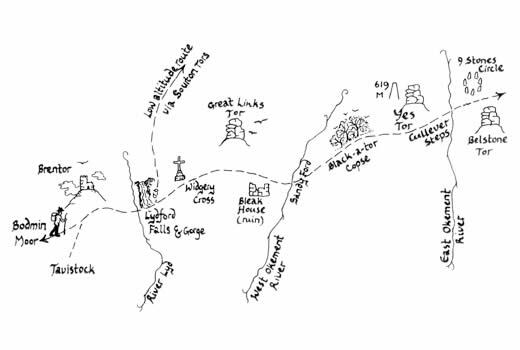 We have tried to stay true to the spirit of the Michael and Mary lines dowsed by Hamish Miller, but recognise the compromise inherent in incorporating points from two separate interweaving lines into one pilgrimage route. 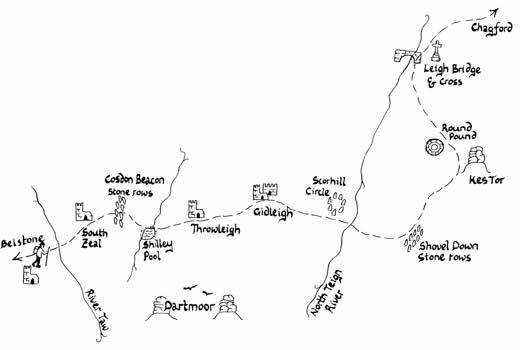 Choices have also been influenced by safety considerations, thus we have avoided all main roads, with stretches of walking on minor roads included where necessary. 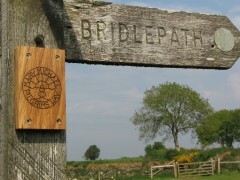 The bulk of the route is on public footpaths and moorland with open access. Other factors such as availability of accommodation and food have also been considered. 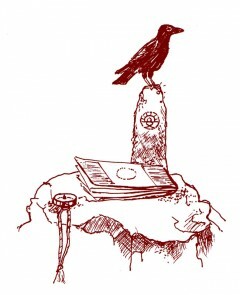 Waymarking symbols are located at strategic points. These are designed to use in conjunction with the guide book rather than to be followed on their own. They are occasional reference points to reassure pilgrims that they are still on track. Whatever your belief system, we hope there will be something life enhancing for anyone who embarks on this journey with an openness to what arises. The sense of treading ground made holy by past events is crucial. The experience of the pilgrim in actually walking in the way of others enables them to become a participant in all that has happened. The pilgrim becomes one with all who have gone before.